Chad Mendes fans need not worry, the No. 1 ranked UFC featherweight contender isn’t leaving the MMA juggernaut anytime soon. Mendes on Monday signed a new eight-fight contract that should keep the Team Alpha Male fighter in the Octagon for the next few years, at minimum. 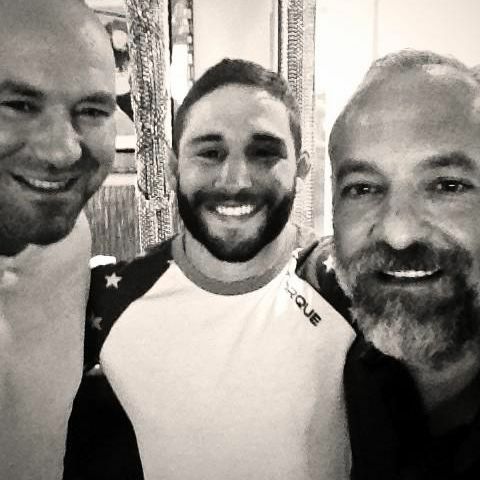 UFC president Dana White tweeted the news, including a “selfie” along with Mendes and company CEO Lorenzo Fertitta. “The deal selfie!! Just got a new 8 fight deal done with @chadmendes,” he wrote. Aside from the number of fights, White did not reveal any other terms of the deal. Mendes currently holds a 17-2 record. The only fighter he’s ever lost to is current featherweight champion Jose Aldo, having faced him at UFC 142 and at UFC 179. Of his 19 bouts, Mendes has fought all but five of them under the Zuffa umbrella, the first four in the WEC before that promotion was melded into the UFC. Mendes enters his new deal coming off of a first-round TKO stoppage of No. 4 ranked Ricardo Lamas. He doesn’t currently have a bout scheduled, but with the deal done, don’t be surprised if an announcement is forthcoming.